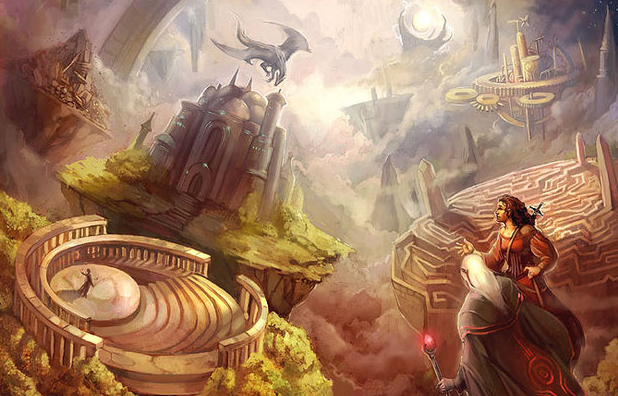 As with all magic the gathering sets, Eathouria has a lore story to go with it. In this story we will follow the elf planeswalker and Gatewatch member, Nissa Revane, immediately following the events of Hour of Devastation. Near-death by the end of the battle, she has fled Amonkhet by planeswalking away to a random plane, saving her life but getting her lost in the process. Nissa’s eyes fluttered open, a dull soreness pulsing through her body. Recollections of the fight with Bolas came pack to her and she startled to her feet from… a bed? Wait. How had she gotten here? Normally she was just sort of… out in the open when she arrived on a plane. Granted, this planeswalk had happened more or less unconsciously—she blacked out at some point after leaving Amonkhet—so what plane was she on exactly? She checked her surroundings. The room was quaint and made primarily of wood, a carpet adorning the floor immediately under her but not covering the whole room. There was a small wood table with a wood cup of water prepared on it, seemingly for her, she hoped. She took a sip of the drink. It was still cold. She looked more. There was unfortunately no windows and thus no way to tell of what the world outside the room was like. However, there was a door, cracked open slightly to show it was unlocked invitingly to the rest of the building. Her staff was cropped up on a wall next to it. She took it without hesitation. She began to theorize she had been found and taken to somebody’s residence, but who? Not wanting to leave the room just yet, she decided to see if she could meet the plane personally and connect with its leylines. She was definitely still weak, though, so she expected it may take some time before she was successfully able to do so. Still, she hoped this plane wouldn’t resist her call as Amonkhet had. She set a hand gently to the ground and was almost immediately tugged in. Whatever plane this was, it seemed eager to have her here, almost too eager. She fell into the land easily. This place called itself Eathouria, but other than that it was hard to garner a general feel for the plane, even if it wasn’t resisting her or pushing her away. At one moment it would be playful and childlike, similar to Zendikar, but the next moment it would be somber and quiet. It was as if this plane suffered from some kind of multiple personality disorder, a constantly shifting nature. Still, all these “personalities” equally shared one thing: they wanted her here. The plane saw her as the solution, at least in part, to a growing darkness, some twisted, writhing thing slowly overtaking the plane. This thing did not engage her, but it did seem to notice she had come. It was less a knot, like Emrakul had been, and more like slimy tentacles of a beast shrouded in darkness. She then woke herself, shaking for a second from the feeling of this darkness. She was currently in no shape to help, not after what had happened with Nicol Bolas. She also needed to find her friends, the Gatewatch, or at least what had been the Gatewatch. Who knew if they would even be an organization after such an absolute, crushing, humiliating defeat? Maybe Ajani had found some success… she could locate him… Well, she certainly needed to find a planeswalker she knew, but… perhaps she should locate her host or hostess and thank them for tending to her before she left this left this plane? Speaking of this plane, she felt a little tug from Eathouria, as if begging her to stick around, even after meeting her host. She sighed. Okay, well, maybe she could at least see what’s wrong with this place and assess the situation before she left, maybe even get the Gatewatch here after they reunited if the threat qualified as something the Gatewatch would deal with. Eathouria seemed satisfied with that thought, at least for now. She cautiously opened the door of this room, a small creek accompanying her. All that was on the other side was another small wooden room, this one illuminated by light coming from two glassless windows, each on one side of a door that she would definitely be money on leading to the outside. This room was arranged more as a meeting space or common room, with a large rectangular wood table in the center, a carpet under it and a pair of comfortable couches on opposite ends of it, a second circular table at the side of the room made of a similar wood to the rest, chairs on any side of that. There was a small sectioned area partially sectioned off by stone countertops that appeared to be a simple kitchen of sorts. On the couches she had seen sat two figures. The first was a girl, if your could call her that, about Nissa's age if her estimate was correct, maybe a bit younger. She resembled a typical human in terms of species, but her body was a transparent dark blue, purple, or black depending on where you were looking. Even her clothing was of these transparent colors. Nissa’s immediate thought was a spirit of sorts, but strangely the plane, while it did have the natural forces of death present as any plane should, didn’t seem to lend itself to spirits existing, at least in a visible way. The other person was nearly impossible to make out any shape from. It seemed to completely cover itself in robes or red, blue, and brown. The only thing visible of its body was where the hood opened up around its head. There wasn’t much that could be seen thanks to how the hood seemed to shadow it over, but very visible in the center-top of this opening was a pair of pupiless blue eyes, gazing at the spiritlike being across from her. They were conversing about something quietly, likely not to prematurely wake her. She chanced walking into the room completely to greet them, tilting her staff to get it to fit through the door. Seeing this, the transparent girl pointed to her and the robed being got up. “You’re awake,” an echoed male voice observes gently, startling Nissa subtly. “Y-Yes I am,” she replied cautiously, not entirely trusting of this creature or the transparent girl yet. “I’m Nissa Revane,” she greeted, hesitantly extending her hand. “Somnium Oneiro,” the being responded, a glowing blue hand extending from the robe to shake hers. The touch of it was like rock, maybe crystal. “And this is Eclipse,” he added, gesturing with both of these crystalline hands to the strange girl. Eclipse got up and came over to Somnium’s side and Nissa offered her a hand as well, but she made no moves to take it. Nissa nodded silently, deciding maybe it would be best to ask questions. “Where am I?” she asked to the pair. She nodded slowly, though half of the sentence didn’t make sense to her. Did she risk asking about what world she was on, as in what was Eathouria like? The majority of beings on a plane didn’t even understand there are countless other unique worlds they can’t go to. How would this one react to the idea? It was a risk… “No, no I… I mean what is this place like? I’m… not from here…” she replied, trying to avoid directly stating she was from this strange place called Zendikar. “Not from here?” Somnium asked in reiteration. “Not from the Thoughtwoods—or a nearby dreammass. Or are you… not from this plane?” he asked in clarification, seemingly hesitant to bring up the second option. Nissa’s eyes widened when she heard that second part. “Not from the plane,” she quickly answered, almost relieved… almost. “Care to enlighten us as to how you got here in the condition you did, planeswalker?” Somnium requested in reply, offering her a seat on the couch next to him. Nissa nodded, slightly frustrated she didn’t get much of an explanation of this world, but perhaps that could come later. “Want a drink?” Somnium asked before she could start. “Water would be ni—” Before Nissa could even finish that sentence she felt something just… appear in her hand from nowhere. Looking down she saw a wood cup filled up with water, similar to the one she had left in her room. She glanced behind her through the door to it, where she could see the table she left the cup on. It was still there. She stared at her current cup, eyes wide. Somnum chuckled quietly. “Well, uh, anyway, I… I don’t mean to panic you with my story but…” she then went on to explain the general gist of things that had happened on Kaladesh and Amonkhet, nothing too in-depth, but enough that it could easily be considered unsettling. “I… see...:” Somnium said slowly after the story. “So you’re from the Gatewatch?” he then asked as a follow up. “Yes, I met some friends of yours, Gideon and Jace, a year or two ago when I first planeswalked. I was offered to join you all as an apprentice of sorts, but I declined until I found my place in the multiverse. Still, I thank your group for their services,” Somnium explained. “Zendikar,” Nissa stated, “but my obligations with the Gatewatch have kept me away from home,” she sighed. “Tell that to the giant serpent that was about to eat her…” Eclipse mumbled, just loudly enough for Somnium to hear, though Nissa thankfully didn’t pick it up. Somnium shot a glare at her. Somnium offered Nissa a hand up and lead her out the door of the place, which was merely a wood hut from the outside. Though, Nissa hardly could glance at it compared to the horizon before her. On one side of her was a massive forest with towering trees, a place that felt welcoming to the Elf, but on the other was something truly awe-inspiring. What she saw was that this was the edge of a massive floating island, sort of like on Zendikar, but it seemed to be resident of an endless sky populated purely by other floating islands, many small, probably only a few hundred feet across, and a few much larger ones. This looked to be one of the larger ones from what she can tell, possibly even the largest in her field of vision. “This is Eathouria, an endless sky surrounded by nothing but these floating islands. Eathourians call them dreammasses,” Somnium explained. “Why use that name?” Nissa asked in reply. “So if… dreamsculpting can make thoughts into reality, what would happen if that dreamsculptor thought of, say, a cat or something? Would that cat materialize alive?” Nissa asked cautiously, shocked by the idea. She felt something furry rub up against her legs. Looking down, there was a small catlike being at her feet. It quickly ran into the woods behind her. “You tell me,” Somnium replied bluntly. Eclipse laughed a bit childishly at Nissa’s reaction. “Not that it’s easy to do something like that,” he quickly added. Nissa saw Somnium’s eyes flicker and droop with exhaustion from that. It had seemed quick and effortless to her, but to... whatever Somnium was, it seemed to be some kind of exhausting. He did at least seem to recover from that exhaustion quickly, though as his eyes went back to their normal size and he stood up a bit straighter. Still, if that was mildly exhausting to the guy, what was the full extent of his powers here? What could he do if he were to completely exhaust himself to the point of death? Nissa was about to comply, but the Vapors seemed to take the form of something humanoid and charge at Nissa before she could react using movements. 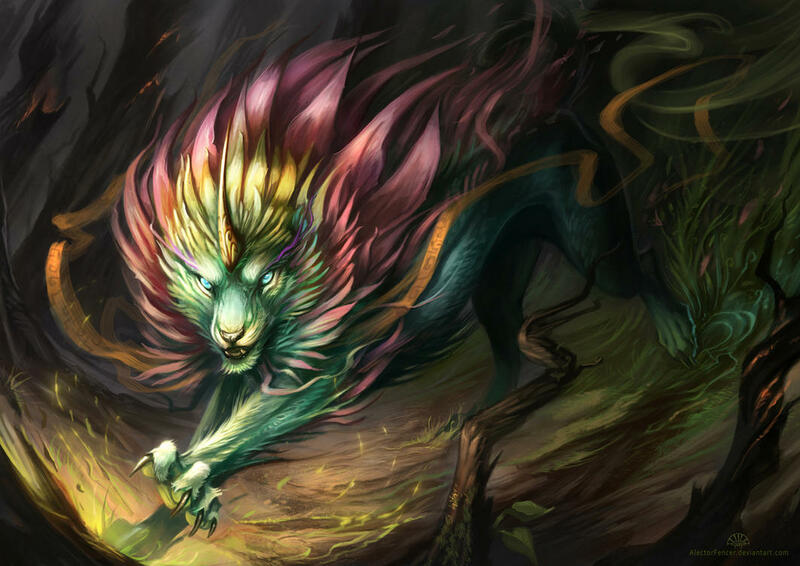 Doing the only thing she could do in this scenario, she called forth the plane to assist her in creating an elemental to crush this… thing, and the plane responded tenfold, though instead of seeing an elemental rise by her side, there was a flash of blue to her right and suddenly a green lion pounced the shadowy being. As this lion clawed and swiped at the dark mist, seeming to actually doing damage to it. Nissa was able to take note that it lacked fur and its skin seemed to resemble leaves and its mane was made of flower petals. What was this creature Eathouria had given her? The lion continued to have at the being until it almost seemed to give up. The cat fell through the vapors and they seemed to gather up and dissipate all at one. The lion took a look to Nissa, then ran off similar to the cat Somnium had made. “What… was that…?” Nissa asked slowly, looking to the pair and pointing to where the lion had run off to. Stories 2, 3, and 4 will be coming soon!!!! (I may be involved in writing a few). Awesome! Hope to see the introductions of Charlotte and Silver! @Tigersol The strange thing about every planeswalking is that the user always somehow ends up in a nice place in a habitable world, even if they do it randomly with almost brain-dead condition like Jace did. (Because it's magic!) Imagine if they landed on Mars, or just atop of a friggin volcano, or just in vacuum of space. Lol. This is really cool! I am really interested!